Charlotte Says YES for ALS! Join us for this free event to raise funds for The Joe Martin ALS Foundation and the ALS Association! We’re saying YES to life with ALS and YES to a cure! Sponsorships are also available! See below for levels and information. – Company Name and logo featured on all promotional materials, media press releases, Foundation newsletter and online promotions. – Company Name and logo prominently featured on all event signage and event tote board. – Opportunity to bring product, company promotional items and demo equipment to event. – Company Name and logo featured on all promotional materials, media press releases, printed materials, Foundation newsletter and online promotions. – Opportunity to bring promotional items to be included in goody bags for guests. ___ Yes! 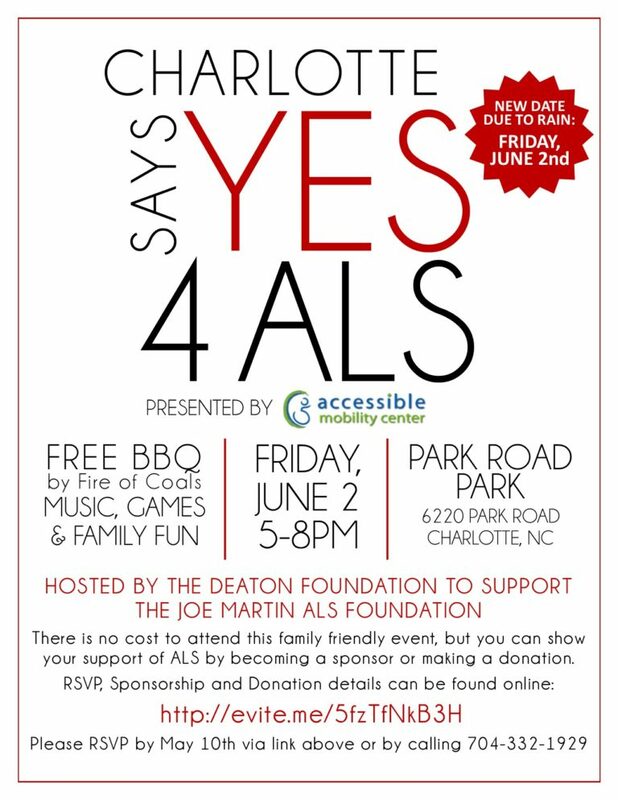 Sign us up as a Sponsor for the Charlotte Says YES for ALS event!